Sick and tired of missing out on your cherished memories because Google Photos not backing up images and videos? Here’s everything you can do to keep your media safe and how to make Google Photos work as intended. For as long as humans have been able to express themselves, we’ve mastered the ability to capture moments in time. From centuries-old paintings by Neanderthals to the cutting-edge DSLR shoots we are capable of taking today – it has always been about capturing those fleeting moments permanently. Thanks to the evolution of mobile devices, we have the ability to capture photos and videos on the go effortlessly. Since most modern mobile devices are capable of shooting high-quality images and videos, the storage file size is considerably large. In order to combat the issue of low storage space on mobile device, Android OS has implemented Google Photos. The stock Gallery app on most Android devices, Google Photos is interconnected with the cloud to offer online content storage. What can you do with Google Photos? However, Google Photos is a lot more than just your run-of-the-mill gallery app, thanks to its integration with Google Drive. Offering the ability to not only store virtually unlimited photos and videos online with Google account, Google Photos is essentially your one-stop shop to view media, share it with other users, do some light editing, and store it on the cloud where you never have to worry about it being deleted accidentally. By simply creating an album and generating a link, you can share thousands of photos at once with other users. Google Photos automatically resizes original images to high quality and syncs them to your Google account for free. On Pixel devices, Google Photos does not even resize the images and offers unlimited storage for full resolution media. From creating collages to conjoining videos and creating movies – you can even create animations with Google Photos. There are plenty of additional features embedded in Google Photos such as creating Motion Photos, a built-in Editor tool, Free Up Space feature and a whole lot more. 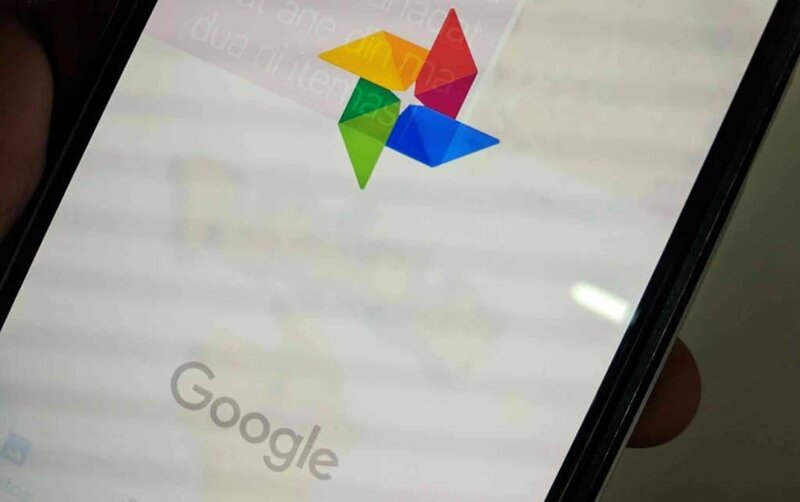 Google has now also included the AI-powered Google Lens feature into the Google Photos app to offer smart visual search. All of these features make Google Photos the obvious choice when it comes to choosing a gallery app. However, users across the Android market have faced issues when it comes to Google’s in-home media management app. From complaints of some media content not syncing, to the issue of Google Photos not backing up entirely, the app hasn’t exactly performed as expected by some users. It can be frustrating to be unable to synchronize the photos and videos from your phone to the Google servers. Whether the issue persists on your Android device or with the Google Photos app, this leaves your media at risk. In order to fix Google Photos not backing up issue for good, a single solution might not do the trick. 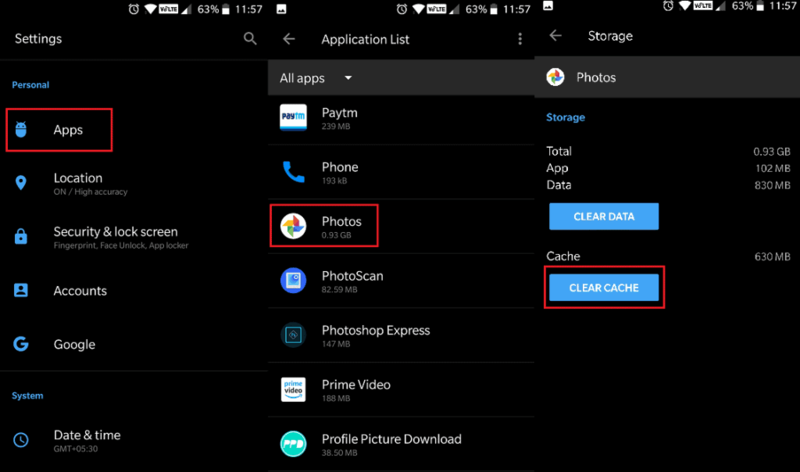 Here are some of the ways you can get past the issues with the Google Photos app on your Android device and have all of your precious memories synced to the cloud. As obvious as it may seem sometimes, the issue with Google Photos can be the lack of an established connection. 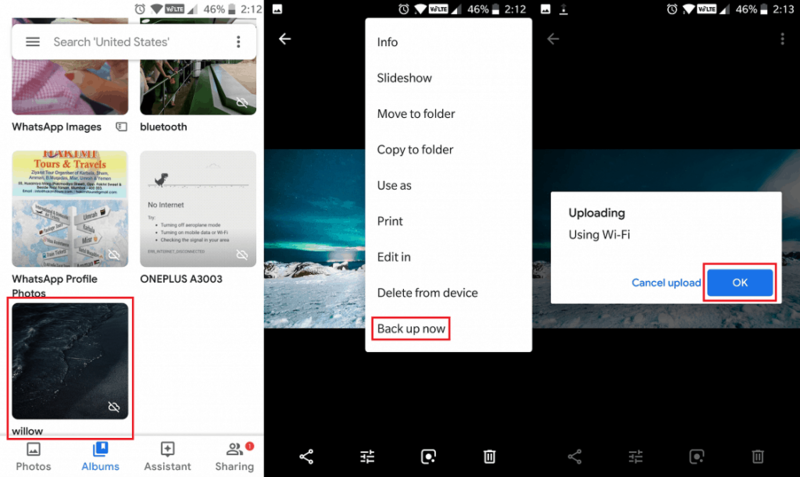 Before you go around worrying why you can’t seem to fix Google Photos not backing up issue, check to see if the Google account that you wish to back up your photos and videos to, is signed into and synced with your Android device. Scroll down to find the Accounts tab and open it to access the Google account menu. 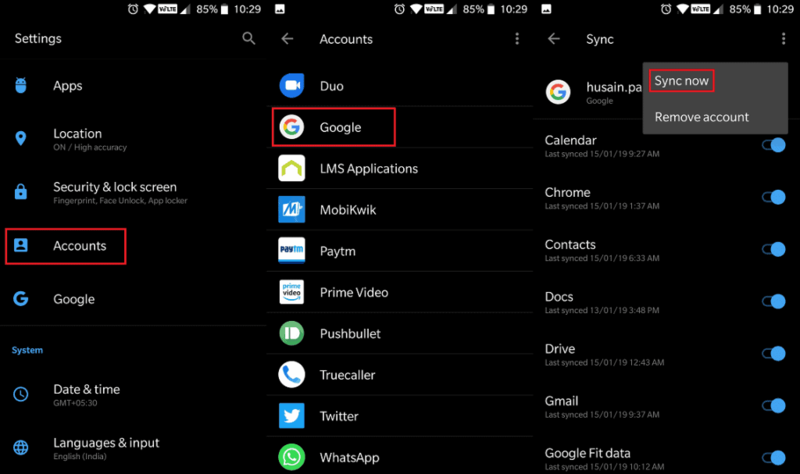 If you have multiple Google accounts set up, tap on the one you wish to sync Google Photos. Additionally, make sure that the Google Drive toggle switch is enabled in the options below. Once you have the Google account signed in and synced with your device, everything should work smoothly. However, if this doesn’t seem to resolve the issue, move on to the next solution right down below. 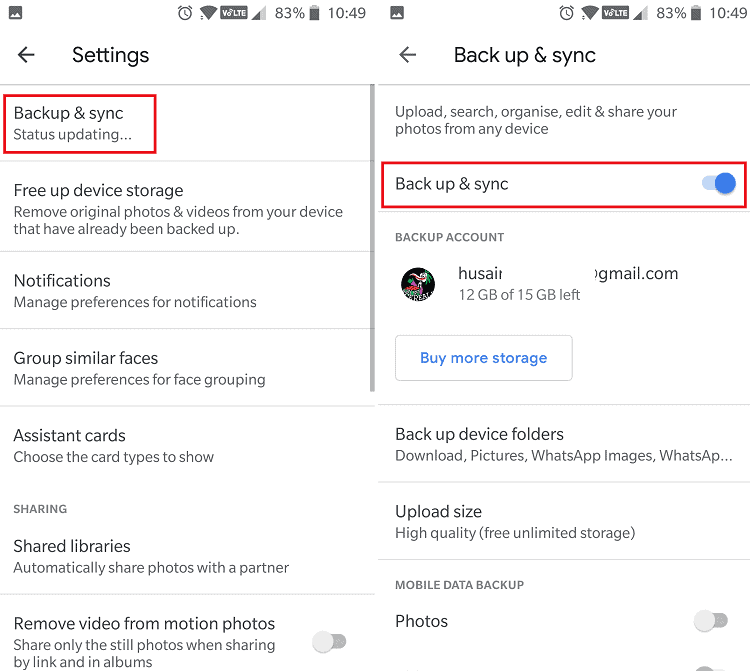 Under most circumstances, Google Photos is given the permission to back up and sync data the first time you launch it. However, if you aren’t able to find your media on the cloud, the problem could be with the fact that syncing isn’t enabled in the Google Photos app. 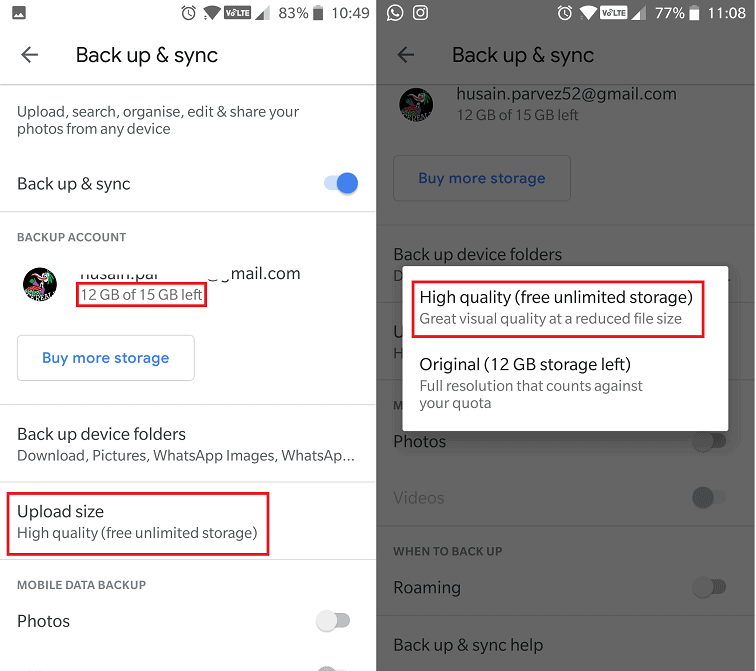 In order to fix Google Photos not backing up issue easily, make sure that Back up & sync is enabled. On the main screen, press the three-line menu button and then select Settings from the slide-out menu. In the Settings menu, open the Back up & sync tab and make sure that the toggle switch next to it is enabled. Tap on the Back up device folders tab and select all of the folders you want to sync to the cloud. Once enabled, make sure that you’re connected to the internet and wait as Google Photos syncs all the media. Scroll down to find the Mobile Data Backup section and enable Photos and even Videos syncing over a mobile network connection if need be. Now simply wait while Google Photos analyzes the media stored on your phone and syncs it to the cloud. If you still can’t view all of your photos and videos in Google Photos, head over to the next fix. To start things off, Google offers 15GB of storage space for free to all Google account holders without any discrimination. While you may think that simply isn’t enough, the best part is that this does not include the storage space used by Google Photos entirely, since you can choose to downsize the quality of the images and videos. However, if you choose to keep all the media in original quality, then you’ll easily run out of storage space. Under the Backup Account section, you’ll be able to view the available storage space left for your account. Tap on the Upload size menu to either select High quality (downsized) or Original (full resolution) quality of the media. The best part is that the High quality option offers unlimited storage space with your Google account. However, if you choose to keep the media in Original resolution and form, the amount of space taken by your photos and videos is counted against your 15GB quota, but you can also go ahead and buy more storage space easily too. 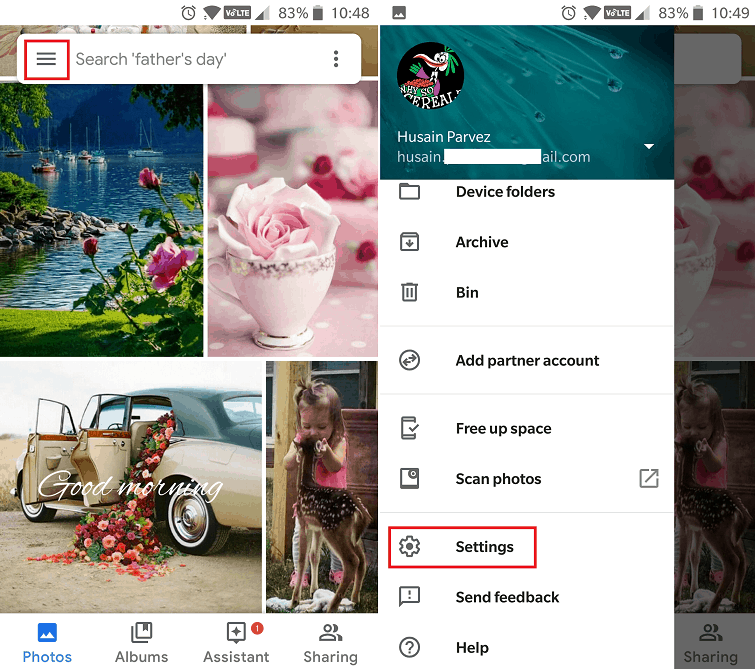 Be certain that all of the above ways to fix Google Photos not backing up issue have been tested. If the issue still persists, go ahead and try to resolve it by working with the Google Photos app itself. Clearing the cache of the Google Photos app can help you flush out broken temporary files which could the culprits. Head over to the Settings app on your Android device using the app drawer or the gear icon on the notification window. Scroll down to find the Apps menu in the Settings. The menu may even be named Application Manager on certain devices. With the entire list of apps on your phone in front of you, go ahead and scroll down to find Google Photos. Start off by pressing the Force Stop button to end any background processes. Head over to the Storage section and press the Clear Cache button and confirm your action. Once you have the This quick solution should help you get rid of any issues that you’re facing with the Google Photos app. While the fact that Google Photos offers the amazing ability to backup unlimited images and videos, but not without limitations. As a general rule to keep Google Photos from becoming a resource that can be exploited, Google has put down some limitations. Images exceeding the file size of 75MB or 100 Megapixels will not be synced. Videos that exceed the file size of 10GB cannot be synced with Google Photos. If the media content on your mobile device exceeds these limitations, then you can expect to run into trouble. You can try to reduce the file size by downsizing the media and then sync it with Google Photos easily. 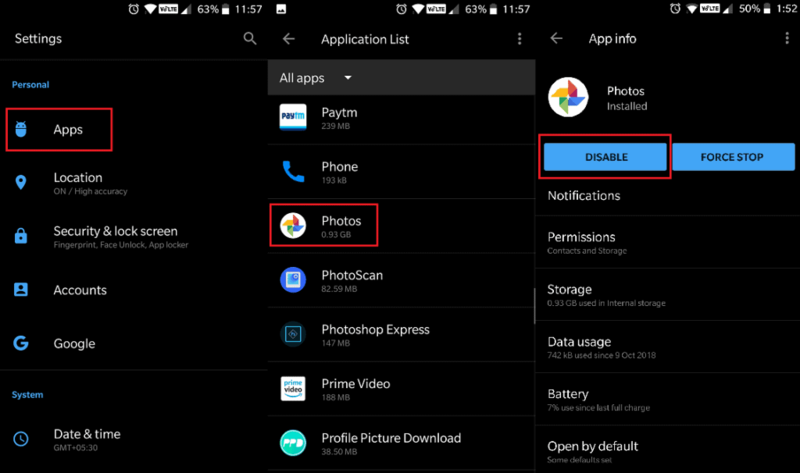 While most of the ways mentioned above on how to fix Google Photos not backing up issue should work, it sometimes is an issue related to the app itself and not the service. If you are unable to find a resolution, the last thing to try out is remove the app entirely. On devices where the Google Photos is a system app, you can still disable and enable it for a resolution. On the app screen, press the Disable button and then confirm you action by pressing Disable App. After waiting a while, go back to the same menu and now press the Enable button and wait for the app to be retrieved. Now head over to the Back up & sync menu in the Settings app and make sure that it is enabled. The Google Photos app will be entirely reset and you’ll be able to fire it up as a fresh install once again. This should most likely fix all of the syncing issues you’ve been facing with Google Photos. Although the Google Photos service is designed to upload media automatically, it isn’t far from being perfect. At times, you’ll probably need to personally make sure that specific images and videos are being synced with your Google account. This is when the ability to manually upload media to your cloud comes in handy, and you can do it directly from the Google Photos app. Access the folder or media file you want to upload to the cloud. On the pop-up screen, select OK to begin uploading the media file to your Google cloud account. The media file will be uploaded to your Google Photos account and will be accessible from anywhere. Not only can you sync the Google Photos account with another phone, but you can also access it online. All you need to do is head over to the Google Photos web platform and all of your cherished photos and videos will be easily accessible. Are you among those who’ve been looking to find a way to resolve the Google Photos not backing up issue? Do you know another great alternative to make sure that all your precious memories are safeguarded on the cloud? Be sure to share your thoughts in the comments right down below.